Nanimarquina, African house 3 carpet: The African House rug has its origins in the fascinating murals made by members of the South African Besotho tribe on the outside of their houses. Nanimarquina, African house 3 carpet: The African House rug has its origins in the fascinating murals made by members of the South African Besotho tribe on the outside of their houses. Besotho women decorate the adobe walls of their homes with plant and flower ornaments, inventing stunning decorative allegories. They are artistic expressions of prayers to their ancestors, to whom they pray for rain, sun and peace. This collection brings us the cultural symbology of this tribe, bringing their exotic exterior motifs to the interior of our homes, giving a certain ethnic touch. 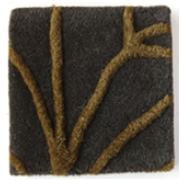 The relief on the wool rug reproduces the mud treatment in their murals, in ochre, earth and sand tones.